Captain Dennis Shepard has served as the Commander of the BPD Community Services Division since February 2018. The Community Services Division consists of the following units: Chaplaincy Program, Explorers, Police Athletic Teams, Internship Program, high school and college, Ride-Along Program, and Volunteers in Police (VIP) Services that helps with a variety of services within our Jail, School Resource Officers and Community Police Revitalization. Captain Shepard organized a Draft Committee to establish a protocol for critical incidents involving the Birmingham City School system by bringing together all the entities that would be involved in a response effort for a critical incident, to ensure a seamless and efficient response as possible could be achieved. In addition this committee also researched additional ways and made recommendations to ensure the physical safety of the students, faculty and other employees of the Birmingham City School system. Captain Shepard is a native of Childersburg, Alabama. He has over 36 years of law enforcement experience. He started his career with the Alabama Department of Corrections where he left as a supervisor after 6 six years to become an Officer with the Homewood Police Department. He served 20 years with HPD serving as a Patrol Officer, Detective, Patrol Sergeant, Detective Sergeant, Administrative Division Commander, Patrol Division Commander and a polygraphist. 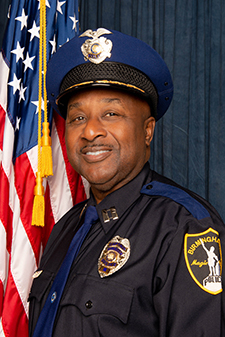 He retired from Homewood Police Department in 2008 and accepted a position with The Birmingham Police Department where he served as Lieutenant, Commander in Administration for 1 year, Commander for Internal Affairs Department for nearly 5 years, and Executive Assistant to Deputy Chief of Investigative Bureau for over 4 years. Captain Shepard has a Bachelor of Science from Tuskegee University. He is also a graduate of the Southeastern Command & Leadership Academy, where he was a recipient of the Innovator Award. He is also a graduate of the Argenbright Polygraph School. Captain Shepard attends the Worship Center Church, Bessemer Campus. He is married to Mrs. Stephanie. M. Shepard, and the father of one son, and two daughters.